Here’s a nice Taylor GS-8 acoustic that was bought at a great deal. 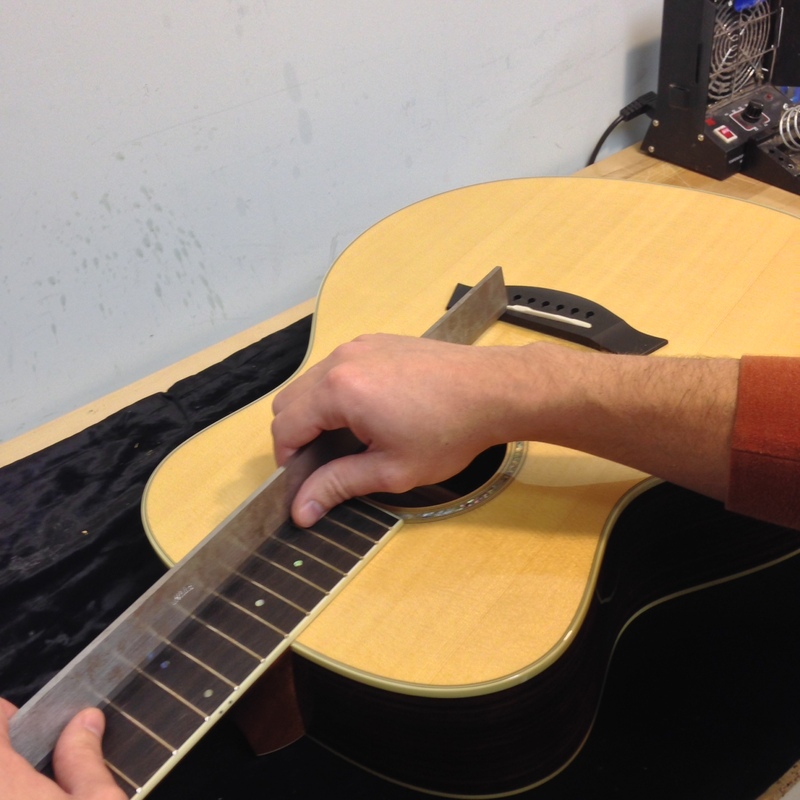 The guitar doesn’t have any scratches or wear, but the original owner took it upon himself to file the nut and replace the saddle with bone. I’m sure he had all good intentions to make it play better, but the nut is too low causing it to buzz on open strings. Also the saddle is really low and there isn’t enough angle off the back to get any focus on the sound or adjust the action any lower than it already is. 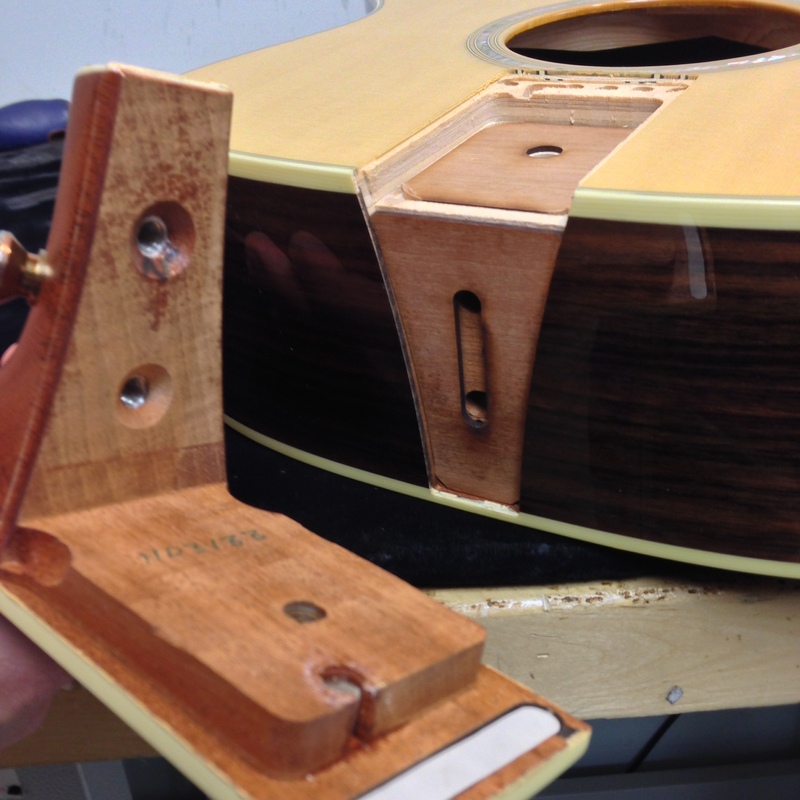 Time to reset the neck angle and replace the nut and saddle. The post ’99 Taylor neck joints make this job much easier. First thing first, before I ever loosened the strings, I checked the neck angle at full string tension with the neck adjusted flat. 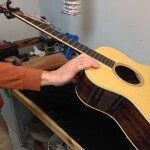 Then I checked it again with no string tension and the neck adjusted flat. I can measure the difference to see how much flex there is under tension to decide how much I need to reset the angle of the neck. This guitar has some flex so I need compensate for that. That being said, I also checked for loose braces as this can increase shoulder rotation. No loose braces on this guitar which is great news. To get started, I use a hair dryer with a short piece of heavy duty flexible hose taped around the end. 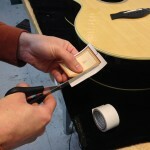 This allows me to funnel the heat from the hair dryer directly to the sticker on the neck block, through the sound hole. After a minute or so the sticker is warm enough to release cleanly without tearing. I put the sticker on a piece of wax paper and clamp it between two flat blocks until I need to reattach it again. Once the sticker is removed I have access to the 2 bolts that attach the neck to the body through the neck block. 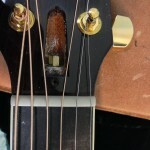 There is also one bolt under the top that attaches the fingerboard extension to the body. A total of 3 bolts are used on this model. 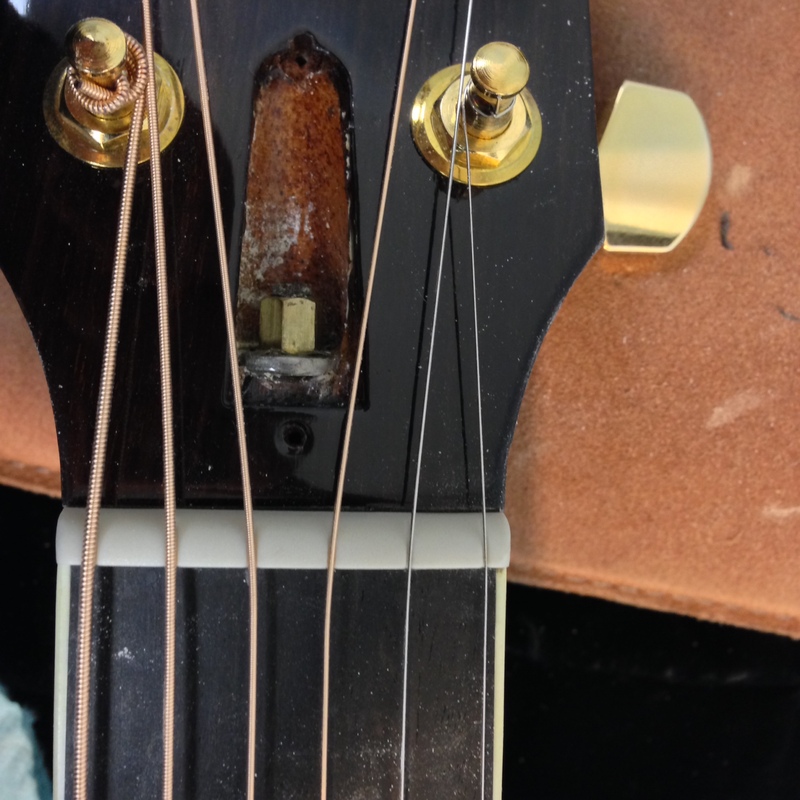 I removed the bolt from the fingerboard extension and the 2 bolts through the neck block and put them aside. Once the bolts are removed, I carefully lift the neck straight up and out of the joint. 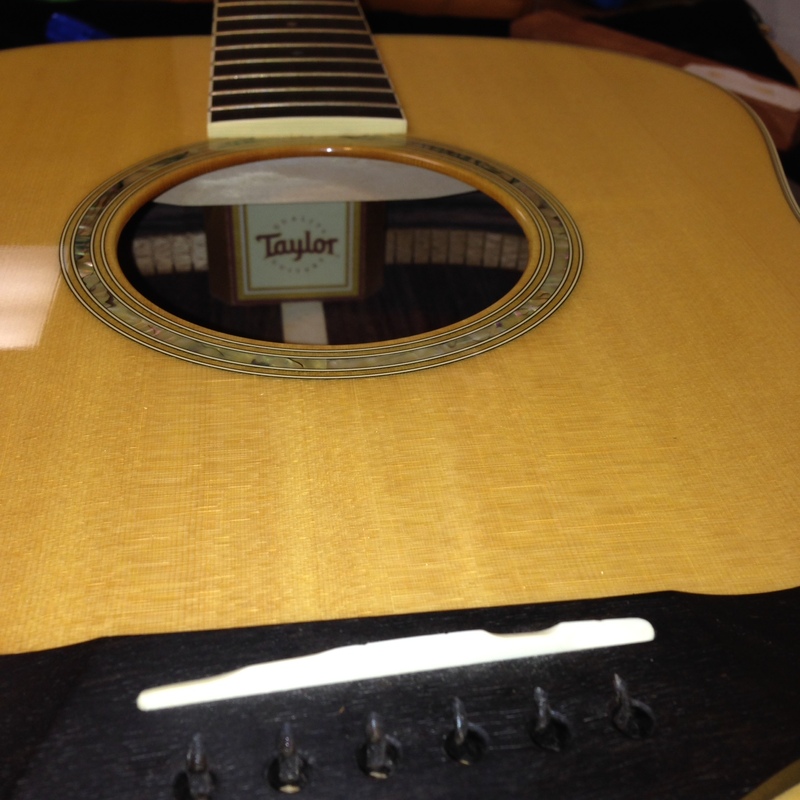 This is good habit because so many Taylor acoustics have a pickup under the fingerboard that can easily get damaged if you aren’t careful removing the neck. It’s also good to mention some people like to use a clamp to secure the neck while removing and installing the bolts. I’m comfortable not using one because I’m used to doing this. Check out this neck joint. 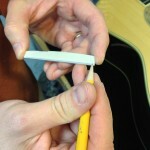 It uses shims to set the angle of the neck against the body. Pretty ingenious if you ask me. There are 2 shims. One at heel of the neck and one under the fingerboard extension. Luckily the there was enough of a kick up at the fingerboard extension to where I probably won’t have to adjust that shim once the angle is adjusted properly at the heel. I remove the shim from the heel and double side tape it to a flat block. I actually reduced the tack on the tape some too so the shim comes off easier. Then I mark the entire surface with a pencil to see where I am removing material. I’ll also measure the thickness with calipers before and after I sand to make sure I’m not getting slanted. Sanding the angle on the shim is not what Taylor recommends. I personally think sanding the shim is easier and faster, plus I can dial in the angle exactly where I want it. I am careful to only remove material from the narrow end of the shim and perfectly taper it towards the wider end without changing the thickness at the wider end. 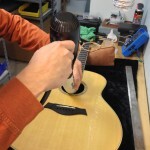 But this does require some skill, and if you aren’t confident, you will need to go through an authorized repair center that can get shims from Taylor. I am way too busy to handle warranty work, so I have to think outside of the box on these newer Taylor neck joints. Even if I have to make new shims myself. After the neck is re-attached to the body with the bolts snug into place, I’ll scope the neck angle one last time by eye to see if there is anything out of sorts. The neck looks perfect so now I can re-attach the sticker to the neck block. I use double sided tape on the sticker since the original adhesive was compromised some from heating and removing the sticker. I did reduce the tack some on the double sided tape with my shirt so the sticker will peel off easy again if need be in the future. Then I reattached the sticker back onto the neck block and you can’t tell the neck was ever removed. Now it’s time to replace the nut and saddle. I removed the old nut by tapping it loose at the end and then knocking it out sideways. 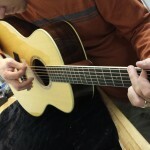 To keep things simple, I ordered the right size Tusq nut and saddle to fit this guitar. That way I only needed to final adjust them without having to make them from scratch. I used the old nut as a reference point to mark the height on the new one. 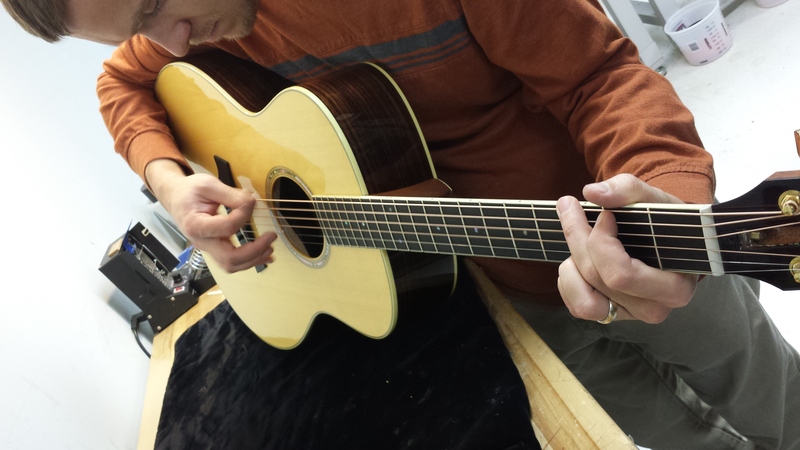 Then I sanded material off of the bottom until the low E and High E string was slightly high over the first fret. 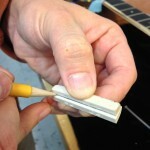 I also adjusted the ends so they were perfectly flush with the edge of the fingerboard. Before gluing the nut into place, I used my nut files to set the height of each individual string evenly over the first fret. Some like it lower than normal but I’m setting this one just under factory specs. Once I get the slots adjusted where the player likes it, I’ll remove the nut and use 600 followed by 2000 grit sand paper to round the edges off and smooth up the ends. Now I can glue it into place. I use a dab of wood glue since the nut fits snug into the channel. Super glue isn’t the right choice here because it won’t give me enough time to center the nut in the channel before it sets. While the glue tacks, I’ll move on to the saddle. The new saddle is too high and a hair too thick. I adjusted the thickness until the saddle fit the slot with the slightest amount of friction. You don’t want it to be so loose that it leans at all in the slot, and you don’t want it so tight where it’s difficult to remove. Just snug enough to where there is friction on all sides of the saddle. Next I sand material off of the bottom until my string height is where I want it by checking it frequently with my low and high E strings. Using a mechanical pencil helps me know how much material is being removed. 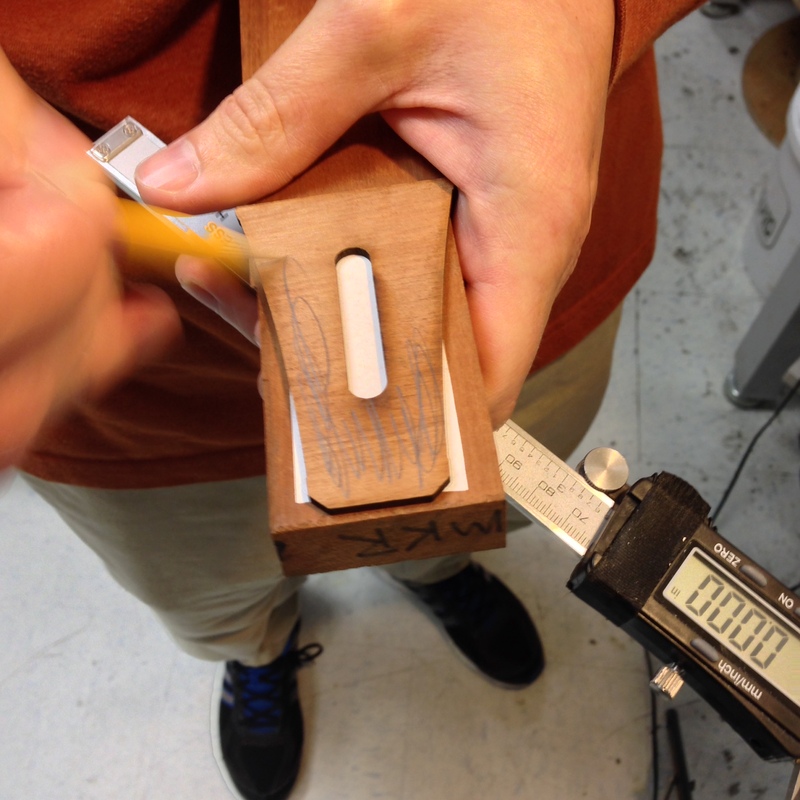 Once the height is to the player’s preference, I’ll make sure the saddle bottom is perfectly flat by finessing it across my 800 grit diamond fret leveling block. You want full contact across the bottom of the saddle slot to give you optimal tone transfer and string balance. Finally I can string it back up to tension and give it a final truss rod adjustment before sending it back to it’s owner. Wow, no question this guitar sounds and plays a million times better than before! And it looks factory fresh again which is always nice to see when you first open the case. This one is good to go for another 100,000 miles. Thanks for taking the time to read this. I hope you enjoyed it! Don’t know if you’re aware and assuming you’re an authorized Taylor repair shop, Taylor will send you some shims if you ask. They are numbered and with the different sizes. At least they used to. Thanks. I actually mentioned that in this blog.